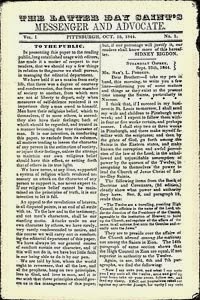 In October 1834, Oliver Cowdery and William W. Phelps started publishing the first history of the church in the Mormon newspaper Messenger and Advocate. They were assisted by Joseph Smith. In 1835, Warren Parrish, Joseph Smith’s secretary, copied this publication to the prophet’s journal. Afterwards, this journal was continued in diary form by Warren A. Cowdery, amongst others. For November 9, 1835, we find the following description by Joseph Smith of his first vision (some minor editing (spelling, punctuation and paragraphing) by mormonism101.com). While sitting in my house between the hours of 10 and 11 this morning, a man came in and introduced himself to me, calling himself by the name of Joshua, the Jewish minister. His appearance was somewhat singular, having a beard about 3 inches in length which is quite grey; also, his hair is long and considerably silvered with age. I should think he is about 50 or 55 years old, tall and straight, slender built, of thin visage blue eyes and a fair complexion. He wears a sea green frock coat, and pantaloons of the same; black fur hat with narrow brim, and while speaking, he frequently shuts his eyes, with a scowl on his countenance. Being wrought up in my mind respecting the subject of religion and looking at the different systems taught the children of men, I knew not who was right or who was wrong and considering it of the first importance that I should be right in matters that involved eternal consequences - being thus perplexed in mind I retired to the silent grove and bowed down before the Lord, under a realizing sense that he had said (if the Bible be true): Ask and you shall receive, knock and it shall be opened, seek and you shall find and again. If any man lack wisdom, let him ask of God who giveth to all men liberally and upbraideth not. Information was what I most desired at this time, and with a fixed determination to obtain it, I called upon the Lord for the first time, in the place above stated, or in other words I made a fruitless attempt to pray, my tongue seemed to be swollen in my mouth so that I could not utter. I heard a noise behind me like some person walking towards me. I strove again to pray but could not, the noise of walking seemed to draw nearer. I sprung up on my feet and, liberated, I called on the Lord in mighty prayer. A pillar of fire appeared above my head. It presently rested down upon my head and filled me with joy unspeakable. A personage appeared in the midst of this pillar of flame which was spread all around, and yet nothing consumed. Another personage soon appeared like unto the first, he said unto me: Thy sins are forgiven thee. He testified unto me that Jesus Christ is the son of God and I saw many angels in this vision. I was about 14 years old when I received this first communication.